You are here: Home / Sponsored / Lugz Brigade Fold Shoes! Hubby wrote this one cause he got to try them first! What a great gift for the guy in your life! Lugz sent me a new pair of Brigade Fold shoes the other day and I cannot BELIEVE how comfortable they are! I am on my feet walking the aisles at Walmart preparing my Reverse Coupon Matchups and Price Match Lists for about 20 hours a week and (on Saturdays especially) my feet would huuuurt. Then I got my Lugz. I’ve worn them for the last 2 weeks as I’ve gotten my lists together and where before I almost couldn’t walk at the end, now I felt great! My feet didn’t hurt, my knees didn’t hurt, it was wonderful! 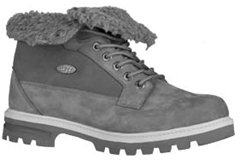 I got the new Lugz Brigade Fold, they are fur-lined and are meant to be worn with the fur flipped out. Well, I am not “hip” enough to know that and I put them on like any old pair of shoes; my daughter had to inform me that I was not wearing them “like the rappers do”. I’ve never been the coolest guy around but now I can’t even put shoes on like the cool kids! I fixed the issue but after she left I put them on the old way, I don’t want anyone mistaking me for a rapper. If you have a job that requires you to be on your feet a lot (or you are a rapper) I cannot recommend these shoes enough. They are very comfortable, stylish and durable. I usually wear through the tread on my shoes pretty quick but the tread on these boots are so thick, I don’t see that happening any time soon. Get yourself a pair today! Would love to win these! Thank you for the chance! My hubby needs new boots desperately! These would be great! My hubby needs these sooooo badly. Winning these would be such a blessing! I like the savings on your site,I shared you on digg and i tweeted you also,It would be nice to win something.